AMBEX--American Bavarian Exchange: Adventures in Prague! Yesterday we traveled to the city of Prague, capital of the Czech Republic. 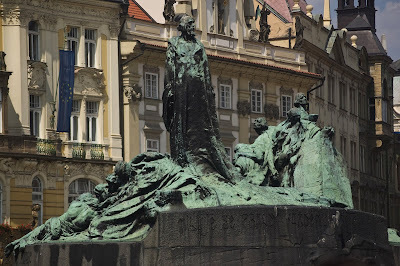 The city has been home to some of history's notable characters; of particular interest to ABMEXers was Jan Hus who started the spark later to be fanned by Martin Luther and other reformers. Memorial Statue of Jan Huss in Prague. After the short road trip from Regensburg we started the afternoon by observing the changing of the guard at Prague Castle. From there we continued through the castle court yard to St. Vitus Cathedral where Dr. Wilson was able to share some artistic insights about various mosaics and architectural features. We continued then to the Charles Bridge and Old Town Square. After this the AMBEXers had a bit of free time to explore the city on their own before we all sat down for some traditional Czech cuisine and desserts! Making most of the opportunities afforded to us- well met AMBEXers! AMBEXers in front of St. Vitus Cathedral. Andrew, Lisa, Brittany and Mark munchin' on some awesome Czech street food! Fall still showing its best colors is Prague. Kelsi, Marissa and Brittany savoring some Czech desserts! We were blessed with as spectacular of an evening as we may have hoped for.